On recent 4th of July travels, my family and I stayed the night at a hotel that promoted their “free breakfast.” Many hotels offer this perk as a way to attract business and compete with other chains. As I sat down to a plate of reconstituted egg product, green banana, and stale pastry the next morning, I couldn’t help but think that it’s not really free. You’ve probably heard the phrase “there’s no such thing as a free lunch,” and even though this was breakfast, the rule still applies. The cost is obviously included in the price of the room. In the investing world, diversification might be the closest thing we have to a “free lunch.” Spreading your money over different types of investments allows you to participate in segments of the market that are performing well and also helps reduce risk compared to more concentrated portfolios. Through the first half of 2017, those that maintained a diversified approach captured gains from multiple areas. 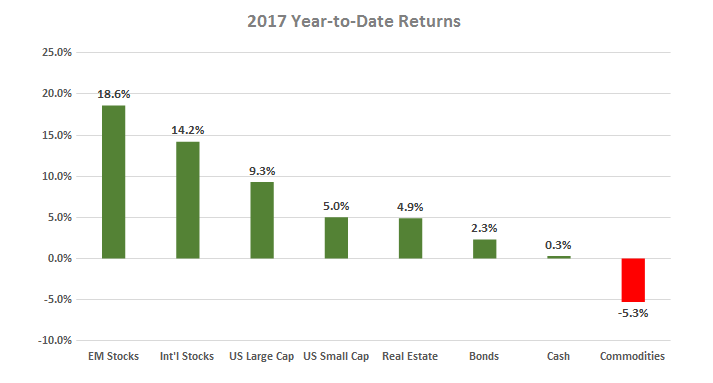 All of the major asset classes produced positive returns during these six months, with the exception of commodities (an asset class we currently do not use). After years of outperformance by U.S. stocks, foreign stocks have rallied to reverse that trend, both in developed and emerging markets. Bond prices generally rose throughout the first half of the year, even as the Federal Reserve continues to raise interest rates. Despite the future path of rates, bonds remain a suitable component for many investors to help preserve capital and to provide a reliable source of income. Looking ahead to the second half of the year, political and monetary uncertainty will continue to cause some uneasiness for investors. The administration’s pro-growth policies have experienced delays and close attention is being paid to the Fed’s decisions on interest rates and stimulus measures. Stocks have become relatively expensive following the eight-plus year run in U.S. markets; however, inflation and rates remain low, markets are liquid, and earnings growth is healthy. Despite somewhat favorable conditions, it would not be unusual to encounter some increased volatility and pullbacks within the near term. Ultimately, most investors will have funding goals that span years or even decades beyond 2017, so we recommend maintaining a long-term focus in order to give your retirement plan the best odds for success.